Tech-Float is the system of bringing the vessels in the advanced technology in order to eliminate the contemporary system and bring the vessel in utilizing the most modern technology in order to have a better safety and operation system.I saw a three year old kid recently with i-pad learning rhymes and alphabets very easily with apps and other videos. Thanks to the technological industry for bringing the life more beautiful and easy. It is my wish and dream come true that the ship should be facilitated by the advanced technology for bringing safer and easier life in ships. In the tech-float system I am going to integrate the shipping equipment and other aspect of shipping as maximum as possible like a checklist, Emergency procedure, various equipments of the vessel. The reason for doing so is the checklist consumes more papers. If the system prevents consuming papers from all the global vessel annual which directly prevents the trees being cut annually for the shipping industry. And also another reason is the majority of the checklist is not filled correctly in time for the particular procedure. It is filled later on for the particular time for solving the purpose for various inspections and surveys. When I analyze what causes the people to fill the checklist later ? I found out that this system gives the chance for the people to fill the checklist afterwards with the system of filling it with perfection. The reason for checklist being introduced is to avoid the ship staff to make human error and not to miss some points in the checklist. With the help of checklist the error in the procedure is minimized. There are three tech-float system which will be present on navigation bridge, Engine room and ship’s office. In the navigation bridge the tech-float system will contain all checklist except engine room, ship’s office will have related to cargo and other shipboard operation checklist with respect to the deck and the engine room will have a checklist related to engineering.The master server will be present in the master cabin and he can monitor everything. For eg., if the navigating officer is filling the change of watch, Traffic separation scheme ,master pilot information exchange , navigating in coastal waters etc. in the tech-float system , the timing is noted in the system and there is no chance for the fraudulent. It is also easy for the navigating officer since he need not take print out of the checklist and the pen to fill the check list. What he has to do is just to open the tech-float system and fill the checklist with touch screen. In the tech-float system ,once the checklist is submitted , it can be in read only format. If the person found mistakes in the submitted checklist, he subsequently has to fill the new checklist and submit. Hence it will be easy for port state control and other surveyors to survey the vessel with the help of the tech – float system and it is also reliable for the shipping company which minimize the error in any procedure. In the tech-float system , the flag state and class can send the various certificates for survey electronically to the vessel which in turn stores in the tech-float system. The advantage of this system is various electronic certificates sent by the flag state and class can be assorted easily. The new certificate replaces the old one and the history of certificates is maintained. This system is easy for any people searching and retrieve the certificate. It will reduce the pain in searching the certificate which is piled up with the old certificates and unwanted papers in the contemporary files. This system allows the various equipment surveys , certificates and manuals to store electronically in the tech – float system. In many older vessels , the user manual for some equipment will be missing , this system will eliminate this problem. The user can retrieve various manual of the ship easily without any difficulty and able to print the concerned section. Often surveyors and repair party needs concerned manual and which is often very difficult to search in the cupboard filled with manuals. In an emergency procedure tech-float system plays a major role in reducing the human error and it can eliminate the more consumption of time. Suppose if there is abandon ship situation on board the ship. 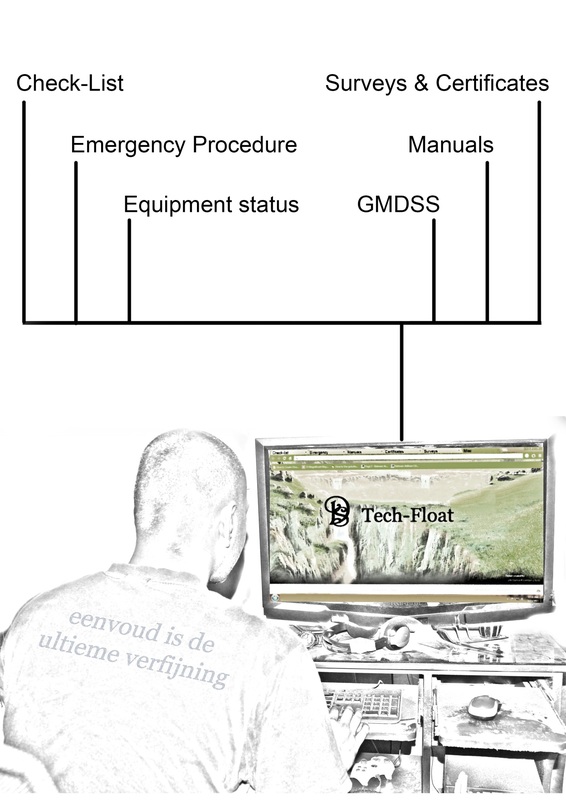 If the abandon ship or fire section is opened in emergency procedure with the tech-float system, it will automatically open the procedure for the emergency, concerned checklist, Noting the timing of the events and the GMDSS distress message can be sent in the tech-float system in a simple way. The tech-float system and various equipment including navigation, engine room equipments and cargo equipments are integrated with the tech-float system. When an emergency situation is selected , the system automatically sends the status of the various equipments and its values to the company and the company can utilize the information for the case study and investigation purpose. The designated distress alert is often time consuming in any emergency. In some case it took only 20 mins for a vessel to sink. The undesignated distress alert in the GMDSS system doesn’t give the clearest idea to the rescue team and cannot able to determine the nature of distress.The concept in the tech-float system is to send the designated distress alert as quick as undesignated distress alert. The designated distress alert in the tech-float system exhibits some drop box, the information which is not known by the system should be selected. The information like position , number of the crew will be taken from GPS and techfloat system which is fed before. While the information in the drop box is selected and submitted , it will automatically convert into specified format and sends through all GMDSS equipments.